Black Friday is always huge for TVs and there are dozens of fantastic Black Friday 2018 bargains out there to choose from. Of course, there’s also another option you might want to consider. Home theater projectors have come a long way over the past few years, and high-quality models are now capable of beaming a wonderfully clear picture even in bright rooms. We’ve tested a number of different projectors over the past year and two of our favorites are by BenQ. 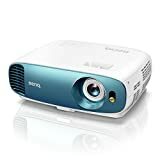 The BenQ TK800 4K UHD HDR Home Theater Projector has a wonderfully bright 3,000-lumen lamp, while the BenQ HT2550 4K UHD HDR Home Theater Projector isn’t quite as bright but it has some other great features. Both projectors have stunning 4K resolution and HDR 10 support, and they’re both on sale for $150 for Black Friday. IMMERSIVE SPORTS EXPERIENCE: Dedicated Football & Sport modes with Cinema Master Audio+2 feels like you’re in the stadium joining in the action.